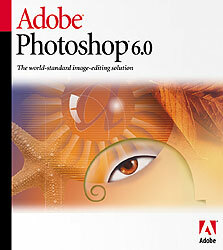 Photoshop 6 is the latest upgrade in the preeminent graphics manipulation software from Adobe. It is an upgrade from Photoshop 5.5 which has worked very well in both print and web for nearly two years and has a very loyal following. Unfortunately, a few people that I have spoken to are a bit resistant to this upgrade, because they fear that they will need to relearn their skills all over again. Let me point out right away that Photoshop 6.0 is wonderful -- there are many obvious differences to get used to, but you will soon embrace these new changes and wonder how you could have worked without them. If you are still concerned, simply leave Photoshop 5.5 on your computer, since both versions coexist quite nicely. There are many more changes I'll be outlining later as I transition from 5.5 to 6.0. Stop back as I explore the changes to Photoshop 6.0 in greater detail, in our ongoing review format. Right now, Photoshop offers so many features not found in previous versions that I highly recommend this upgrade.